When I teach Prenatal Yoga my focus is on guiding women towards their inner wisdom. What I mean in broad terms is intuition, instinct and “feminine knowing”. I know your mind wants something more tangible and believe me, mine sometimes too. But this is the thing, how to explain instinct and intuition tangibly, let alone “feminine knowing”? It’s impossible to measure or fully explain intuition and instinct. This doesn’t make them less valuable than reasoning. It is not a case of ‘either/or’; we want to use our heart and our brain in life, but often gut feeling is crowded out by reasoning. We live in a very brainy world, a world that values reason over intuition. When it comes to natural birthing, however, women are asked to fall back onto intuition and instinct. Why? Because you can’t give birth to a child naturally by thinking it out. In fact, I would want a woman to stay away from thinking as much as possible, to stay out of her neo-cortex, because it is contra-productive to the hormonal cycle of birth. Plus, the thinking brain is where human inhibitions come from. Instead of thinking I want her to be able to zoom out and fully give herself over to instinct, intuition and – yes – a leap of faith, so she can do what she needs to do. 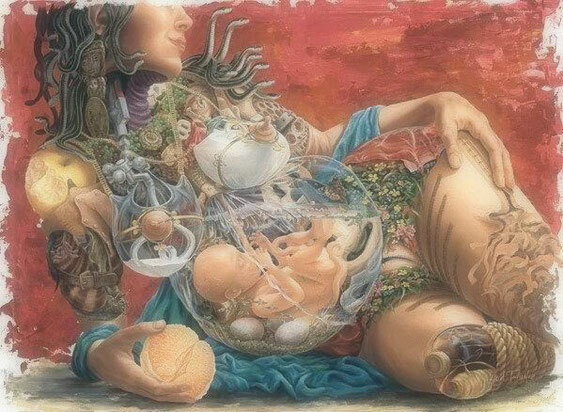 She carries the baby, she feels her baby and often enough, if we let her, she knows how to birth her baby. She might do this in total silence or singing and praying. She might be loud and extroverted or quiet and inside herself. What I experience in my work and within myself is that when it comes down to intuition and instinct we just don’t trust it enough. We like to have someone to confirm in words what we are feeling and perceiving to give us a sense of security. However, words are the wrong tool – it’s like using a net to try and catch the sea. Instead we need to learn to trust ourselves and give intuition the value it deserves. For these reasons I focus on encouraging women to feel and tune into themselves during prenatal yoga and life in general. My experience has been that if we practice something long enough it becomes a habit and so it is with trusting our intuition and instinct. So what can a woman expect when joining my class? All of this takes her out of the brain and into the body. Her beautiful female body. Something I let her know over and over again. Without her, there wouldn’t be human life. None of us would be here. We don’t honor them enough; instead we treat them as patients which of course, most of the time they are not. What they are is amazing creators – they conceive, nurture and bring forth life. And going back to my prenatal yoga class, I also share with her my knowledge on latest evidence-based research. Because as I said earlier, we want to use guts, heart and brain. As a Doula, a professional childbirth companion, I know from experience that if a woman doesn’t trust her own intuition, instinct and reasoning, decision will quickly be made for her by others and that often means unnecessary inductions and medical interventions. I would argue that many of them could be prevented if women are more confident and are encouraged to trust their own inner guidance and to give voice to it. My prenatal classes will encourage a woman to stand in her power and be less talked into preferences, conveniences and the fear-based opinions of others. To find out more about my teaching schedule please refer to my Prenatal Yoga page.